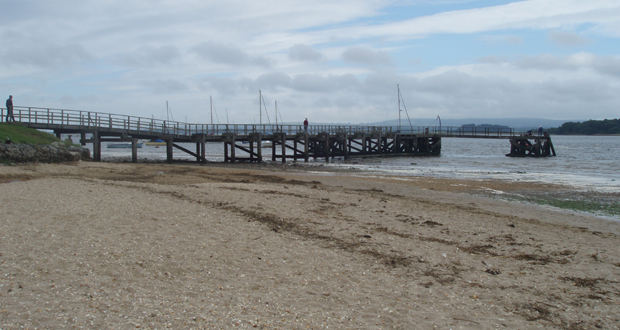 An idyllic stretch of beach located in Hamworthy on the upper shores of Poole Harbour. 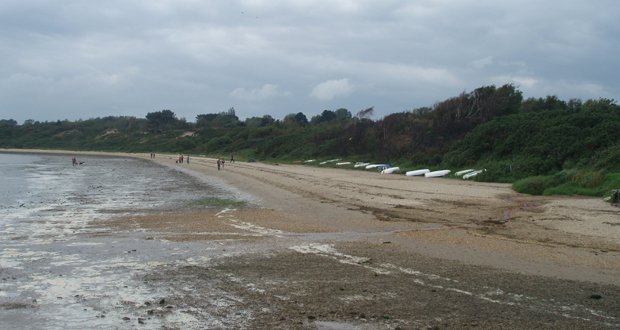 The beach is a mixture of sand and shingle but can get a little muddy at low tide, and it leads up to a popular nature reserve, Ham Common. There is an old wooden jetty which was originally constructed to ferry clay from the ‘Doultons Clay’ workings which is now a lake. The area has quite an historic past as the beach was originally used to prepare troops for the D-Day landings on 6th June 1944. Back then the local base was known as HMS Turtle and many various flying boats would take off just off shore. Nowadays the Royal Navy use the base as a training centre for their SBS (Special Boat Service) Unit manned mainly by ranks from the Royal Marines. Ham Common is a mixture of shrubs and heathland and there is a lake, although it is not safe for swimming. The common is a Special Site of Scientific Interest (SSSI) and is often referred to as Hamworthy Common. A very popular beach for dog walkers, as dogs are allowed all year round and there are a number of walks through the common and along the beach. There is also a small car park for 63 cars.